Spray 6-quart slow cooker with cooking spray. Place chicken breast in slow cooker. Season with salt and pepper. Top with mushrooms, then chicken broth. In medium bowl, mix Alfredo sauce and garlic. Pour over chicken and mushrooms. Cover; cook on Low heat setting 5 hours. Shred chicken with 2 forks. Add cheese tortellini and spinach to slow cooker; stir. Cover; cook about 10 minutes or until pasta is cooked. Top servings with Parmesan cheese, and enjoy. Not a fan of mushrooms? Feel free to leave them out, and add in some extra spinach. If you have garlic lovers in your family, you can try using a garlic-flavored Alfredo sauce for even more flavor. Make a five-star dinner in your slow-cooker with this easy recipe that calls for only seven ingredients. It’s no wonder this recipe is a favorite considering it features cheesy tortellini, creamy Alfredo sauce, hearty chicken and plenty of veggies. 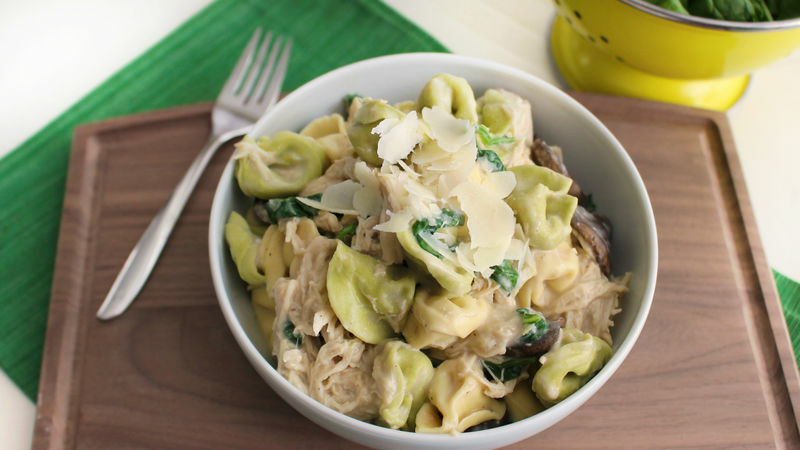 Even better, it only takes three simple steps to serve up this hearty chicken tortellini alfredo for eight, just dump the ingredients in the slow cooker, wait five hours and shred the chicken — voila, dinner is served! So next time you know you’ve got a busy day, do yourself a favor and get this meal going early. The whole family will enjoy coming home to this cozy supper. If you need a tortellini dish you can whip up right now, Betty’s got plenty more tortellini recipes, plus all the tips you need to buy, store and cook pasta.